Don't you just love when you get that "word that was meant for you" at just the right time. Sometimes several times in the same day. Well, just be honest ... sometimes you have to get hit over the head before you realize it was a word for you! HAHA! I was in my car the other day and that was what happened. I was listening to an amazing podcast from Terri Savelle-Foy and she said something that was so very profound. 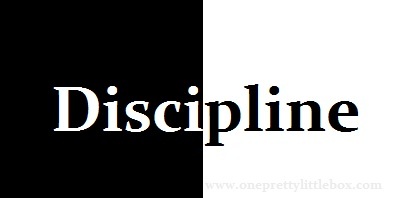 Every single one of us have discipline in our lives, even if we think we don't. We all are disciplined for something. The example she gave was that some of us are disciplined for that cup of morning coffee, so much so that we could do it in our sleep if we so desired. Some of us are disciplined to smoke a cigarette after a meal. Some of us are disciplined to exercise every morning. Let's take a look at what that word means. Discipline is best defined as training expected to produce a specific character or pattern of behavior, especially training that produces moral or mental improvement. Never say you do not have self discipline because you do. Every choice you make either helps to make or break a habit and you are becoming more disciplined one way or another. Positive or negative! One of my favorite sayings is "Discipline is doing what you know needs to be done even if you don't feel like doing it.". I am not sure who said it but in reality that is a great quote for willpower rather than discipline because like I said before you can be disciplined in a negative way. Please be encouraged to recognize the type of discipline that you are expressing in your day to day lives. It says a lot more about you and what you believe than your words will. You also open the door to opportunity or slam it shut. You have to make a choice... don't leave it to chance! There was a time in my life where was very disciplined to only clean house when I was hurt, mad, or sad. When I was happy it would be a complete mess, yet chaos was forming inside. There was a time when I was very disciplined to exercise every single day until I got out of the habit. Remember, there are no excuses just choices. Oh me too! I LOVE that! :) Thanks for stopping by! I am looking forward as you and others share their journey in just HOW they are disciplined!